My homeschool lesson planner changed with certain phases during our homeschooling years. Below I will briefly describe each phase and my solutions. The young children phase where my children were both young enough to share some classes. I used a classic two-page spread and it was perfect. The cells were large enough to split with a pencil line for those subjects that were not shared. If you look at the image on this page, you can see that at: Scan of Donna's Old Planner. The children no longer officially shared a class and that resulted in dropping the two page weekly planner, which, in my option is a really nice planner because there is so much room for plans and for white-out. I started using weekly planners. After a year or two of using weekly planners, I decided that I found individual weekly planners a hassle ( I didn't have to show my lesson plans to any official entity anyway) and that resulted in the invention of the quarterly planner, aka subject/term planner/Master Planner. My brand new subject planner presented its own problems and you can read more about that at the Subject Planner article. Despite its minor problems, I never went back to weekly planners. A solution to one of the problems allowed me an opportunity to teach my children how to organize their day. After using the subject planner for a day, I realized that I needed a single form to display the completed classes. I designed the checklist and that solved the problem of turning pages to see what had been completed. I soon realized an opportunity for my children to gain experience with personal responsibility and organizational skills. I asked my children to check-off the classes when they were completed. A nice thing happened - they loved this; they danced, hopped, and giggled to the checklist. They, especially my older child, realized what it means to get one's work done. For my children's 8th grade year I provided master lesson plans for science class. This gave them the option of reading ahead for the class, and that was optional. They were also aware of test days and which days were set aside for studying. They could use this to their benefit if they chose to do so. During the next two years, I provided them with master lesson plans for additional classes. 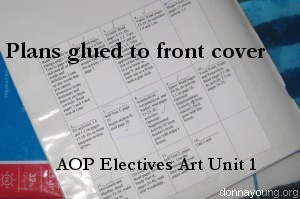 By gluing or attaching the lesson plans into the school books. There were a few high school years during which I did not have a big planner full of papers, I only had the subject plan masters, a school calendar, and a general outline of the day. During high school years, I used G&A, an xls file that I had made for myself to record grades and attendance. Prepare any reference documents the child needed for the classes - An example of this would be my grading criteria for certain things such as labs and written assignments. This reference would resemble a class syllabus in some ways. Some might call this unschooling; I couldn't say, but my children exhibited a high degree of interest in certain subjects. In those subjects, I provided as many resources as I could find and stepped back. Lab Sheets - I stumbled upon the lab sheets page and, there, I rewrote, updated, and added files. Then I updated the old lab sheets. Have you ever wondered what it means to weigh grades? You can read about that at this page: What is Weighing Grades?.